What Happened in Ecuador on September 30th? 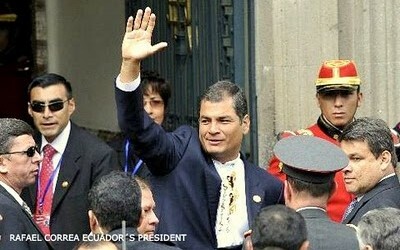 WHAT HAPPENED IN ECUADOR ON SEPTEMBER 30? To understand what happened in Ecuador September 30, look at the hemisphere. From this perspective, Ecuador’s coup appears to be the latest in a series of attempts to overthrow Latin American governments seen as allies of Cuba, an extension of the cold war whose web of intrigue ties back to Washington. On September 30, 2010, several police stations across Ecuador began protesting, ostensibly angered by proposed changes in benefits. But in addition to protests at police stations, the major airports were taken over by the Air Force and police, including a US-trained anti-narcotics unit, as were some of the media outlets and the national congress, a coordinated set of actions, all classic elements of a coup. Slightly before noon, Ecuador’s President Rafael Correa visited one of Ecuador’s largest central police stations in an attempt to understand what he still believed to be protests. The officers launched four tear gas canisters from close range at Correa, provoking injuries for which he was taken to the Police Hospital. While being treated he was informed by police that he could not leave the hospital. Slightly after midnight a joint military and police operation, coordinated by high-ranking officers who remained loyal to the President, overtook the hospital in a gun battle and rescued the president. President Correa, on national television, explained that as he was being rescued the order went out over police radio “Kill the President” and officers fired on him, killing a loyal police officer escorting him and impacting his armored vehicle. A total of 10 people were killed and 274 injured in the events. Forty-six police officers have been arrested. Though the Wall Street Journal and other mainstream press outlets dismissed the events as a police protest, given the course of events this is not realistic. As in any coup, a group of conspirators, a junta, plan and carry out an action hoping that other elements of the national security forces will follow; the degree to which the armed forces join in the action determines its success. The real question is not whether it was a coup attempt but who was behind it. Immediately after his release, Correa explained that while in dialog with the police officers that instigated the events, many expressed allegiance to “Lucio,” a reference to opposition leader Lucio Gutierrez. Gutierrez, a former president and military officer, is a controversial figure in Ecuador, and for years has been rumored to have ties to the CIA. Fidel Araugo, a former major in the Ecuadoran military and close associate of Gutierrez, was arrested on October 5; his image had been captured in video footage of the uprising in Quito’s first police regiment, where Correa was attacked. Gutierrez then reportedly traveled to Washington, and unconfirmed reports place him visiting Washington lobby firms. Lobby firms played an important role in Honduras’ post-coup international politics. Less then two weeks earlier a delegation of opposition politicians from the Ecuadoran congress had visited Washington. Bolivian President Evo Morales, days after the Ecuador coup attempt, described the events as an attempt to destabilize ALBA (Bolivarian Alliance for the Americas), citing coup attempts in Venezuela in 2002 and Bolivia in 2008, and the 2009 Honduran coup as actions with a common origin: economic interests affected by the governments, as well as the United State’s dissatisfaction over military base closings in Ecuador and Bolivia. Morales commented that coup attempts will not occur in Colombia or Peru, the close US allies in South America. In the case of Bolivia, Morales’ referred to a 2008 campaign of violence in Bolivia surrounding the nationalization of natural gas interests and involving an autonomy “movement” in the Department of Santa Cruz promoted by regional economic elites of Croatian descent with fascist ideology. The violence culminated in the “Pando” massacre of 35 indigenous campesino supporters of Morales by forces linked to the “autonomy movement” and the expulsion of then US Ambassador to Bolivia and now Assistant Secretary of State for Intelligence Philip Goldberg. (Goldberg held a key diplomatic position in the Balkans during the negotiation of the Dayton Agreement). Goldberg had publicly met with Bolivian ‘autonomy movement’ leaders and covert coordination was suspected. To date normal diplomatic relations have not been reestablished between Bolivia and the United States. Then in April 2009, in what Morales cites to be a related event, Bolivian authorities raided a hotel in Santa Cruz where a group of mercenaries – suspected of a plot to assassinate Morales – were staying. Three were killed and two detained; they held Croation, Irish, Hungarian, Romanian and Bolivian nationalities. The mercenary cell’s reported leader was Eduardo Rózsa Flores, a war hero in Croatia who led an international brigade in the Balkan war. Cuban sources claim Rozsa Flores had sustained communication with Armando Valladares, a Cuban American former prisoner in Cuba, and that the cell was being financed by a New York based NGO. Valledares was Ronald Reagan’s Ambassador to the United Nations. He is a close friend of Carlos Montaner and was presented an award by Honduran coup co-leader Roberto Micheletti during Micheletti’s post-regime regime. Also honored in the same ceremony was Alejandro Peña Esclusa, arrested in Venezuela on July 12, 2010, on charges of a planning a bombing and destabilization campaign to interrupt the recently completed Venezuelan midterm elections. International condemnation of the coup was unanimous. Even neighboring Colombia and Peru, which have had strong diplomatic clashes with Correa’s government over the past several years, closed their borders. UNASUR, the Union of South American Nations, convoked an emergency meeting of foreign ministers currently taking place in Argentina. UNASUR has much at stake. Since the coup in Honduras, Latin America has been on edge with constant coup rumors, or even coup attempts, such as in Paraguay. Correa warns the attacks are only beginning in Ecuador. Though a coup by the police appears to break with the military coup paradigm for Latin America, in reality the events were just like a military coup and appear to have involved elements of the military and ex military officers. Nonetheless, the fact the police took a key role in the incident is significant. As Latin American nations broke from explicitly military governments in the 1980s, the nations attempting to secure civilian control of security operations began focusing on reducing the role of the military and strengthening the national police forces. The United States also began focusing on police aid and training. Ecuadoran press cited Ecuador’s Foreign Minister as stating “I firmly believe that Mr. Obama has had nothing to do with this, and trust that his principal advisors did not either. I cannot say the same for the groups of power that exist in the United States.” He went on to note that members of the antinarcotics force that closed the Quito airport on September 30 had been trained by and has had strong relations with the United States. As some human rights organizations in Washington continue to maintain that US police aid to Latin America is important in stopping the high levels of violence, and make a strong distinction between police and military aid, in reality the trend with initiatives like Plan Colombia, CARCI and the Merida Initiative is to blur the lines between military and police actions. And, as we see in the case of Ecuador, we must question – given the role of the US in promoting coups in Latin America in the 1950s to the 1980s – whether a US role in “police reform” in Latin America lends itself to promoting stability and democracy, or will it increase violence and instability? * Please re-distribute and re-publish this article, properly citing author and source. Originally founded in 1983, Rights Action is a not-for-profit organization with tax charitable status in the USA and Canada. Since 1995, Rights Action has been funding and working to eliminate poverty and impunity and the underlying causes of poverty and impunity in Guatemala and Honduras, as well as in Chiapas [Mexico], Salvador and Haiti. We directly fund and work with community-based development, environmental, disaster relief and human rights organizations. (In 2010, to date, we have sent over $600,000 to community-based development, environmental, disaster relief and human rights organizations) And, we educate about and are involved in activism aimed at critically understanding and changing unjust north-south, global economic, military and political relationships.